The ideal partner for fitness, endurance training or a kettle bell. The weight is made from neoprene enclosed steel core. This ensures a relatively heavy weight at smallest sizes. Thanks to the firm neoprene coating the barbell lies perfectly and comfortable in the palm of your hand and can also be opened after use Easy to clean. A very practical side Abflac the metal core, which is a roll of the weight off. 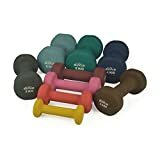 Depending on the selected Weight The dumbbells come in 9 attractive and trendy colours. The weights of the dumbbells are designed to have the training intensity in small steps of 0.5 able to raise up to 1 kg. The lighter weight (0.5 up to 1 kg) are to the (Power) walking or jogging, The larger is commonly used for targeted muscle training. We hope you enjoy and success with these weights. It is empfieht order 2 or more sizes as well to try out you favorite training weight.